If you are like me, you are constantly planning. The holidays may be months away but I love to think about what I am going to give my friends and family. Anjali of The Picky Eater has a wonderful website devoted to healthy food that tastes good. I was intrigued by her DIY vanilla recipe and asked her to share it with us. It takes 2 months to steep so get on it, people! Snack Girl: What is your healthy eating philosophy? Anjali: My healthy eating philosophy is all about balance: eating whole foods, avoiding fast food or processed food, but still leaving a little room for indulgences once in a while. I believe that you don't have to deprive yourself to be healthy, and that with a few simple tricks, you can make healthy food taste amazing. My philosophy is about having your "cake" and eating it too - as long as it's in moderation! Snack Girl: Why did you make your own vanilla? Anjali: I had heard that making your own vanilla from scratch results in a much more flavorful vanilla extract, and I was interested in all the options for customizing it to my tastes. Since it was so easy, I figured I'd give it a shot. And I have to say, the homemade vanilla did taste fresher and was absolutely delicious! Snack Girl: Where can you buy vanilla beans and small bottles to store the vanilla? How long will it keep? Anjali: You can buy vanilla beans in bulk on eBay or in Costco for pretty reasonable prices, and I just went to Target to get small glass bottles (inexpensive) for storing the extract! It should keep for months on the counter. Anjali: I'm a huge fan of cut up stone fruits with Greek Yogurt and 1 Tbsp of granola: cherries, nectarines, peaches, plums - so so good! 1. Split the vanilla beans in half lengthwise. 2. 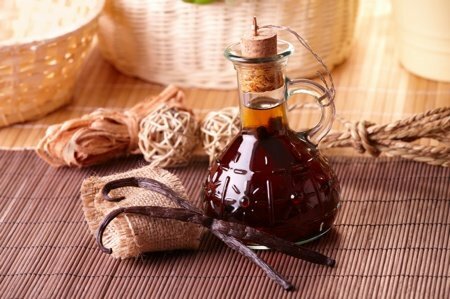 Place the vanilla beans in a jar and cover with alcohol, making sure they are completely submerged. 3. Cover the jar and give it a shake. 4. Infuse for at least one month (2 months is great for a stronger flavor) in a cool dark place, shaking it from time to time. 5. Strain the mixture through a cheesecloth when you are ready to pour it into bottles. Have you made your own vanilla? Please share. It does seem simple enough. I'll bet it tastes great. That's a lot of vodka. Does it burn off or is it that you used use small amounts? You only ever use a teaspoon of vanilla at a time, and if you cook or bake with it yes, it will burn off. This sounds great! I just might try it myself. I learned how to make my own extract in elementary school, I'm 44 now. I can make 20 different extracts and can't tell you how many oils. I know how to make candles as well. My father used to be in his workspace for hours on Saturday's, it was his quiet time. I used to watch him and learned so much. I make this all the time but I use rum instead of vodka. Also, the recipe can be halved. How amazing that you posted this today! My son has a corn intolerance, so most store-bought vanillas are off limits for him. Just last night I was wondering if I might be able to make it myself to save a bit of money. Thanks so much for sharing this recipe. Can't wait to give it a try! Thank you! I DO make my own also, using rum but I have never thought of giving it away as gifts. Everyone can use vanilla! What do you use for labels? I love this. I had completely forgotten about making my own. It is just soon enough to make now for the holidays. Many flavoring are made with alcohol but some use a non-alcohol base. If you check the bottle ingredients most indicate alcohol on them. No big deal except for those who cannot have alcohol. Somewhere on the net there are recipes for making coffee liqueur too. You can make your own using vodka, sugar and berries, or vanilla beans or coffee beans. If you don't have time to let your recipe sit for months, you can make it overnight by use a yogurt setting (Instant Pot multi cooker) or yogurt maker. I will be making plum pudding, black plantation cake and fruit cakes this year too. Yummmmmmm! I use brandy instead of vodka. It takes a week or two to start. I've not made vanilla, but last year I gave friends a low-sugar, home made cranberry/orange sauce that was a big hit. Nothing artificial - just cranberries, orange juice and zest, and a kiss of sugar. I make my vanilla with brandy. I always have two bottles going. One steeping and the other to use. We all love it.